Collector's interfaces to analyze compliance data and to configure the framework are all grouped in the menu Compliance. Switch between compliance views using the drop-down menu. This view has 4 stacked panels. The top 3 are folded upon page load. This panel present the compliant/not-compliant status aggregated by module. The aggregation is done on the data cursor filtered in the downmost, unaggregated, view. The number of nodes checked by this module. The number of nodes passing the compliance checks of the module. 100 * Ok / Total. Week over week plot of ok/not ok/not applicable status returned by modules for the node. The plotted status are the worst case in the week, meaning if a module returned 'not ok' then 'ok' during week 50, only 'not ok' will be accounted. This panel present the compliant/not-compliant status aggregated by service. The number of modules checked for this service. The number of modules passing the compliance checks for this service. Week over week plot of ok/not ok/not applicable status returned by modules for the service. The plotted status are the worst case in the week, meaning if a module returned 'not ok' then 'ok' during week 50, only 'not ok' will be accounted. This panel present the compliant/not-compliant status aggregated by node. This view is also used to pilot remediation campaigns, using the action tool on selected servers. The number of modules run on the node. The number of modules passing compliance checks. This panel present the compliant/not-compliant status without aggregation. It can be used to filter the dataset aggregated in the above panels. The module run date on the node. The module action which returned the logged status. Always 'check' in this view. The module check run status. Can be 'ok' (0), 'not ok' (1) or 'not applicable' (2). A run over run status sparkline. This columns present no timeline information. This view presents raw logs of the compliance modules runs on every nodes. The module action run date on the node. The module action which returned the logged status. Can be 'check', 'fixable' or 'fix'. The module action run status. Can be 'ok' (0), 'not ok' (1) or 'not applicable' (2). 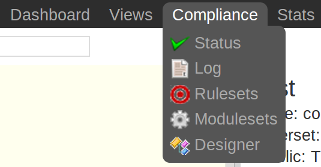 The output of the compliance module for the run. This tabular view is optimized for browsing and searching the configured compliance rules. Some design actions are available from this view, but the preferred view for a compliance design session is Compliance > Designer. The new ruleset now appears in the ruleset list, ready to receive variables. If the ruleset is contextual, the following procedure attach a filter to the ruleset. Cloning a ruleset helps administrators who want their rulesets immutable : when a variable change is needed, the administrator clones the ruleset and apply the change to the clone. This governance policy implies ruleset names are versioned. This facility is offered by the bottom tables of the ruleset view. The table filters are useful to select the nodes efficiently. The filters view allow compliance administrators to create complex filtersets to limit the ruleset scope to a specific node cursor. All fields from the node asset table can be combined. A typical filterset would be 'All Red Hat 4 servers whose team responsible is SomeTeam'. A filterset is a combination of filters or filtersets. Filters are created through the top table and filterset created through the bottom table. Only member of the 'CompManager' group are allowed to create or edit filters. Set a filter value. The wildcard character for the 'LIKE' and 'NOT LIKE' operators is '%'. List values for the 'IN' and 'NOT IN' operators are comma-separated. Filtersets are created empty, then filters or filtersets are attached to the new filterset. Set a logical operator to combine the filter/filterset with. Available logicial operators: 'AND', 'OR'. Of course, more explicit filterset names are recommended. Only attached modulesets' modules are scheduled for a compliance action by the OpenSVC agents. Only member of the 'CompManager' group are allowed to create or edit modulesets.